Insolvency and Bankruptcy Code, 2016 consolidates and amends the laws relating to reorganization and insolvency resolution of corporate persons, partnership firms and individuals in a time bound manner for maximization of value of assets of these persons, to promote entrepreneurship, availability of credit and balance the interests of all the stakeholders. Part II of Insolvency and Bankruptcy Code, 2016 deals with matters relating to the insolvency and liquidation of companies and limited liability partnership firms. In this article we will discuss about the fast track method of filing an application under corporate insolvency resolution process. What does the Code say about Fast Track IRP? Such other category of corporate persons as may be notified by the Central Government. An unlisted company with total assets, as reported in the financial statement of the immediately preceding financial year, not exceeding Rs.1 crore. 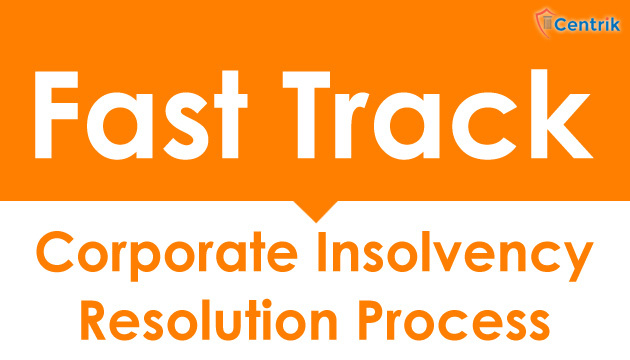 Section 56 of the Code requires that the fast track corporate insolvency resolution process shall be completed within a period of ninety days from the insolvency commencement date. The resolution professional shall file an application to the Adjudicating Authority to extend the period of the fast track corporate insolvency resolution process beyond 90 days if instructed to do so by a resolution passed at a meeting of the committee of creditors and supported by a vote of seventy five percent of the voting share. Upon receipt of such application, if the Adjudicating Authority is satisfied that the subject matter of the case is such that fast track corporate insolvency resolution process cannot be completed within a period of ninety days, it may, by order, extend the duration of such process beyond the said period of ninety days by such further period, as it thinks fit, but not exceeding forty-five days. However, any extension of the fast track corporate insolvency resolution process under this section shall not be granted more than once. Such other information as may be specified by the Board to establish that the corporate debtor is eligible for fast track corporate insolvency resolution process. In case of fast track insolvency resolution process the resolution process shall be completed within 90 days after the process is initiated, with a maximum one time extension of 45 days by NCLT. It is important to be aware about the laws that benefit us and now that we have rules that regulate recovery of bad debts the Corporate Creditors should utilize it to their maximum benefit and retract money back to their accounts. NCLT has ensured speedy disposal complying with the rules. With the advent of reformation in the economic situation, the need for these laws have been felt now and then to deal with defaults effectively.